To make use of fixed time rates you will first need to ensure this option is enabled in Advanced Settings. 1. From Admin click Advanced Settings. 2. If the option is turned off select Use fixed time rates and click Update. Once this setting has been enabled you will need to set up your time rates. 1. From Admin click Time Rates. 2. Click on New Time Rate. 3. 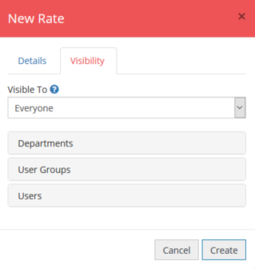 In the pop-up window enter the Rate Name as you would like it to appear on the expense for the user to select. 4. Add a Reference if you have this rate set up with a reference in your accountancy package. 5. Enter the numerical Rate to be used. 6. 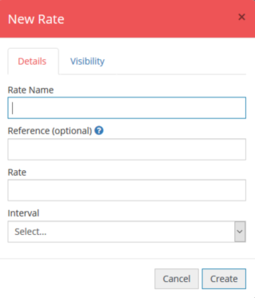 Choose from the Interval drop down whether it is an hourly or day rate. Click on the Visibility To drop-down. Click to select who you wish to see and access the new Rate. 8. Once you are happy with the inputted information click Create to add this time rate to your account.